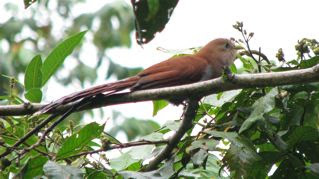 Squirrel Cuckoos (Piaya cayana) are so named because they can be mistaken for squirrels as they hop from branch to branch of a tree, or run along tree limbs. It only flies short distances. This cuckoo is a resident breeding bird from northwestern Mexico to northern Argentina. It is quite a large bird (about 18 in or 46 cm) with that long tail, so it's easily noticed moving about in a tree. They feed on large insects such as caterpillars (even those with stinging hairs and spines), cicadas, and wasps, occasionally consuming small lizards and spiders. They are a palette of colors with the chestnut brown above, a paler reddish throat, a gray chest and a black belly. Their eyes are ringed with yellow-green to match their bill and the long tail is boldly banded underneath with flashes of white. It certainly grabs your attention in the trees at first glance. They are considered common in Costa Rica but it took me 15 days at La Selva Reserve to see one as I crossed the river bridge after lunch. 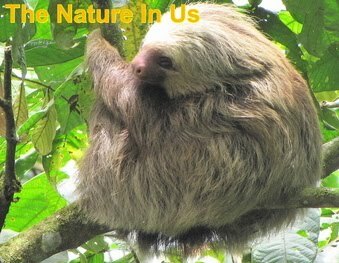 They are tolerant of human disturbance as long as wooded land remains. 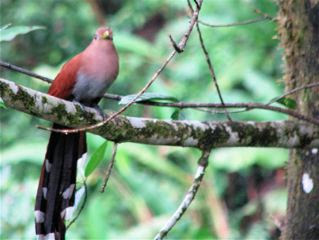 Some cuckoos are parasites of other birds laying their eggs in nests they haven't built, but not the Squirrel Cuckoo. They build their own nests and raise their own young. Generally 2-3 eggs are laid and both parents incubate the eggs.